What’s Not To Love about You? The Rat’s are back! The original West End cast return for a UK tour and two weeks in St Louis Missouri before going back into the West End at Wyndhams, now making it 8 West End theatres now having been played. Is this a record? Making a return to the Adelphi Theatre with The Rat Pack! Mark is delighted to be going back in to the West End to kick off the Rat Pack for a limited season at the Adelphi. 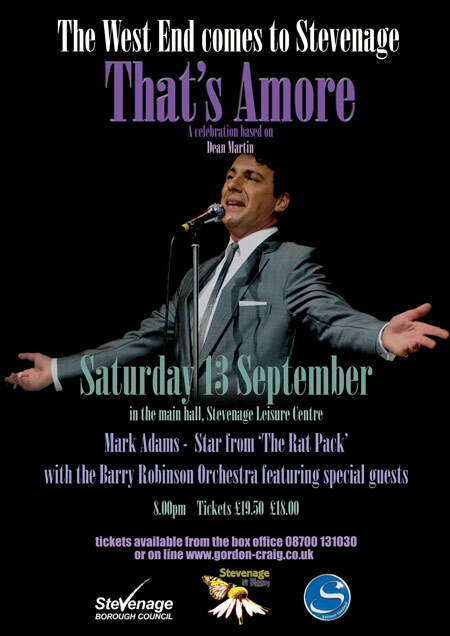 Opening 24th September Mark will perform for one month on his days off from That’s Amore. We are pleased to announce dates for U.K and U.S. tours of That’s Amoré from September to December 2009. Tickets for the UK tour are now available through CrowdSurge. These dates are also available in the Calendar. Any more dates that are confirmed will be added in due course. The new website is now more-or-less fully up and running. Please check in regularly for news about Mark Adams and That’s Amore. Mark will be spending much of January on the high seas. He will be entertaining the passengers onboard the Queen Mary on their cruise from Grenada – Rio. Then, at the beginning of February, he will be on the Queen Victoria for their cruise from Honolulu to Apia, Samoa. Between these two stints on the ocean wave, Mark will be returning to The Marlowe Theatre in Canterbury, on Sunday the 25th of January, with That’s Amore. He is delighted to be bringing the show back to the first venue they ever played with the show, almost 2 years ago. To book tickets, please visit The Marlowe Theatre’s website. Looking ahead to later in 2009, plans are afoot for a UK Tour with That’s Amore. We will, of course, have more details about that as they become available. That’s Amoré Coming To Stevenage! ©2008-19, Mark Adams :: Website by Full Refresh :: Powered by Wordpress.